Many have their eyes on Muller, a talented young maker. They foresee him as becoming one of futureâ€™s greats, therefore his works experience strong value appreciation. Heâ€™s an excellent engraver and forges his own Damascus. 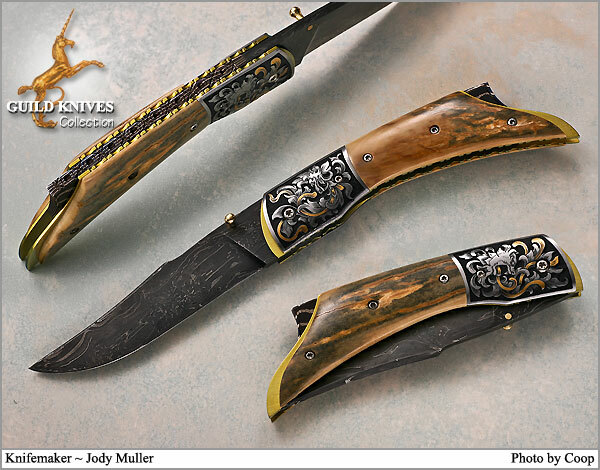 On this well balanced folder, Gold inlays weave through the engraved bolsters. Backspine and gold anodized Titanium liners have detailed filework. 18K Gold thumb bob.